As the official kick-off of the holiday season, Thanksgiving and its food-based festivities make for an exciting time of year. Of course the focus of our favorite fall-time holiday is gratitude and expressing thanks for all the wonderful things in our lives, but there’s no escaping the eleph… er, turkey in the room when it comes to what we all think of when we think of when we hear the word Thanksgiving. We’re talking food, and lots of it. Whether you’re a pumpkin pie guy or a cranberry sauce connoisseur, the most important meal of the year means a lot. 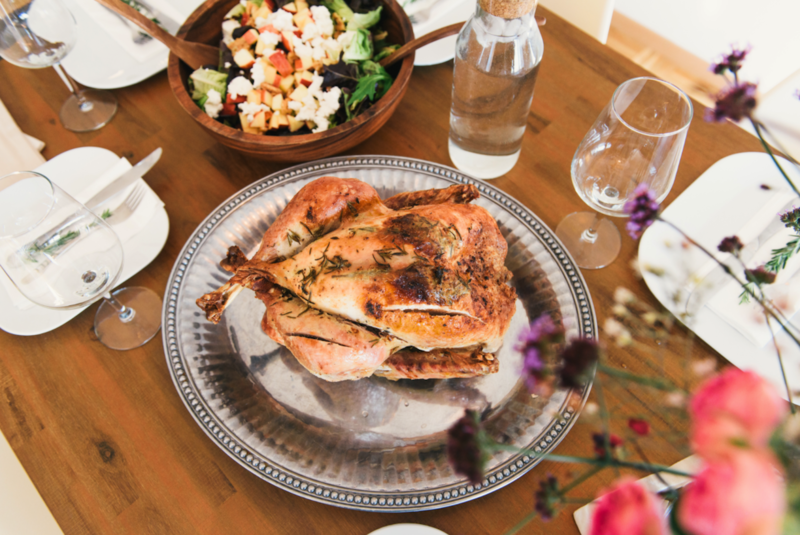 With a house full of family and heart full of thanks, follow these quick cooking safety tips to ensure this year is your best Thanksgiving spread yet! If you purchase the turkey 1-2 days before you cook it, plan to keep it in the fridge. Any earlier, and the bird should be stored in the freezer. Purchasing two different thermometers will ensure your turkey is always at the optimal temperature to promote food safety: one in the fridge to make sure it is stored at 40 degrees °F or below, and one to be positive it is cooked at a safe temperature. Properly defrost the turkey by allowing one day to thaw in the refrigerator for every 4-5 lbs. Be sure to cook the turkey immediately after thawing. Wash your hands with soup and water (for at least 20 seconds) before AND after handling food. Always keep raw meats and all other foods separate to avoid cross-contamination, including using separate utensils and dishes. Don’t worry about washing the turkey. Only full cooking the meat can kill bacteria, while splashing the pathogens to other surfaces while washing is likely. When checking the internal temperature of the turkey, insert a thermometer into the innermost part of the thigh to ensure it has reached at least 165 °F. Keep a close eye on your cooking and never leave it unattended. Always keep a lid nearby to smother small fires that may ignite. If a fire does arise, turn off the burner and place the lid over the pan until it is completely cool. Keep flammable items such as food packaging and oven mitts away from burners to prevent them from catching fire. Remove remaining stuffing from the turkey and store separately in the fridge. Leftovers should be refrigerated within two hours to prevent bacteria growth. If you don’t plan on eating leftover turkey within 3 days, store it in the freezer instead of the fridge. Store leftovers in shallow containers. Provide guests who live more than two hours away with ice packs or a cooler when sending leftovers. Be sure to check the kitchen before leaving or going to bed to ensure that all ovens, burners and appliances are completely turned off.